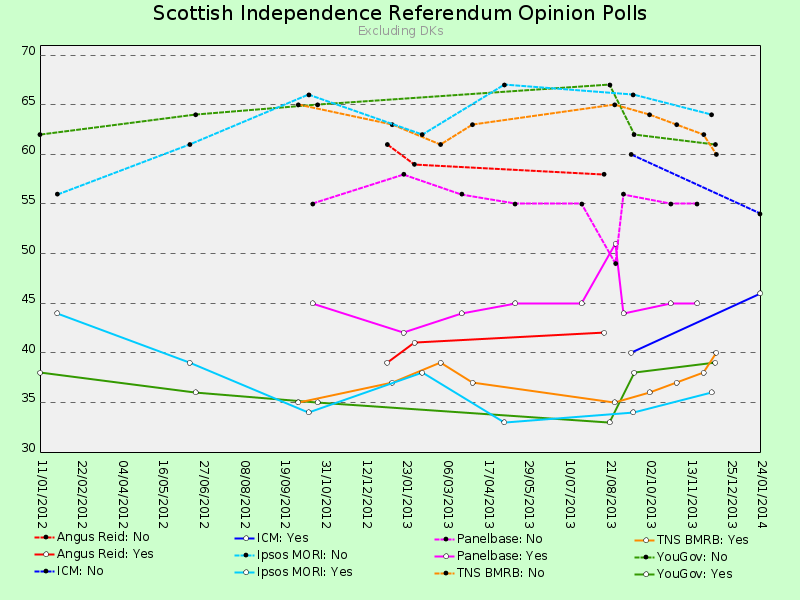 I haven’t discussed the independence referendum opinion polls for a long time, mainly because they haven’t shown a clear picture. However, the polls are starting to converge. To see why, let’s first look at the raw Yes/No results reported since the beginning of 2012 (see the graph on the right — click on it for a larger version; all data from Wikipedia). At a first glance, the picture isn’t very clear. Some pollsters are showing a strong movement — for instance, TNS BMRB is showing an enormous fall in the number of No voters since early 2013 — but it’s hard to spot a uniform pattern. 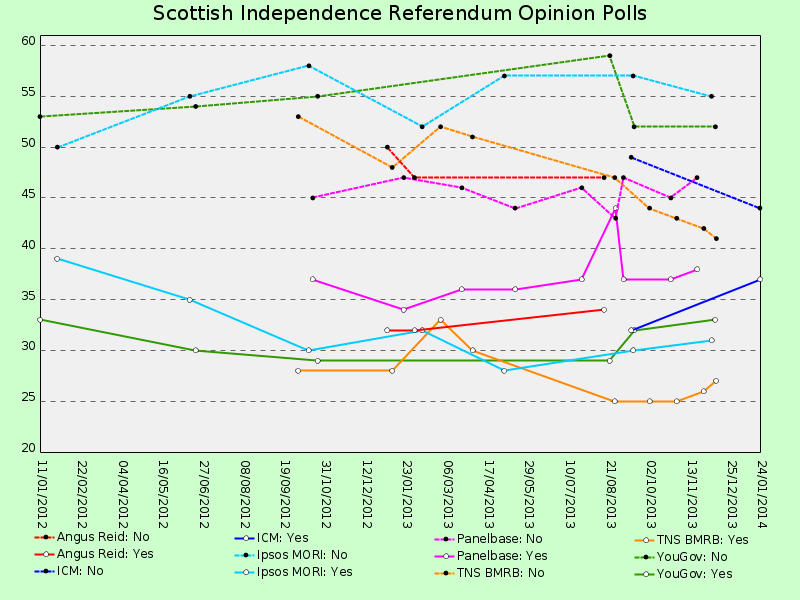 Indyref opinion polls, DKs excluded. To make the results more comparable, many experienced psephologists recommend excluding the undecided voters (see for instance this blog post by John Curtice from last September). If we do that, Ipsos MORI, TNS BMRB and YouGov move closer together, but there are still huge differences (see the graph on the right). Very broadly speaking, it does look like Ipsos MORI, TNS BMRB and YouGov are in agreement, just as Angus Reid and ICM seem to concur, and Panelbase appears to be on its own. There’s no way to conclude at this stage who’s right and who’s wrong (we won’t know until the day after the referendum), but the gap between the first group and the second one is about six percentage points, and the gap between the second one and the third one is about three points. 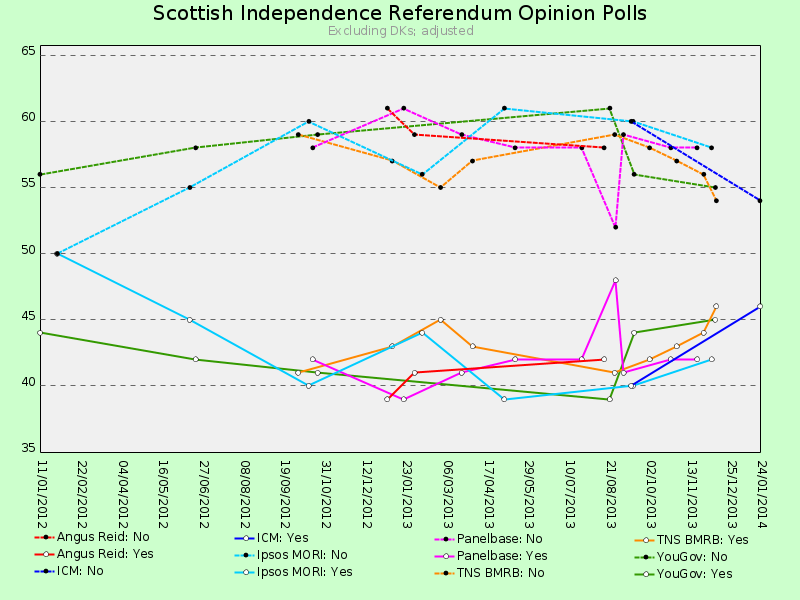 Indyref opinion polls, DKs excluded, adjusted. If we adjust the opinion polls by this amount, it becomes much easier to spot common trends. Of course, nobody knows for sure which pollster to use as the target, so I’ve done this exercise three times, once for each pollster group. However, to save space I’ve only included the graph where Angus Reid and ICM were to chosen to be the target that the other pollsters were brought into line with (see the graph on the right). When displayed like this, it becomes very clear that the support for the No side seems to have peaked around the summer of 2013, and that Yes has been rising ever since. 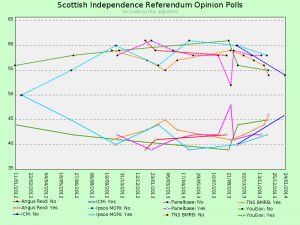 If we were to draw a trend line through the results since August 2013, these adjusted figures would lead us to expect a very respectable Yes victory (55% to 45%), and Yes should overtake No in polls adjusted this way around mid May (the trend line isn’t shown on the graph). 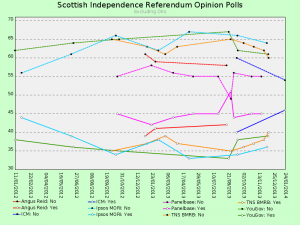 On the other hand, if we adjust Panelbase, Angus Reid and ICM to force them into line with Ipsos MORI, TNS BMRB and YouGov, the trend line leads to the conclusion that Yes will lose by a bawhair (49% to 51%). And finally, if we adjust all the other polls to bring them into line with Panelbase, it looks like Yes will win by a landslide (58% to 42%) and that Yes will overtake No as early as late February. 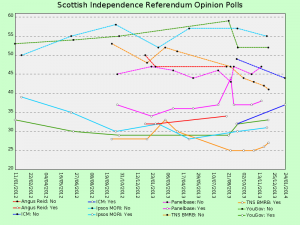 To summarise, if Ipsos MORI, TNS BMRB and YouGov are right about the proportion of Yes voters, we should expect a very close referendum result if the current trends continue; if ICM and Angus Reid are right, we’ll see a solid Yes victory; and if Panelbase are right, we’ll get a Yes landslide. There’s a lot of work still to be done for the Yes side, but it’s very clear why the No campaign is starting to panic. Great analysis, Tam. Very encouraging data.